Do a search for monopod accessories and you might be surprised with the results you get. After all, a monopod is such a basic piece of camera gear what kind of accessories for monopods even exist. They are often overlooked as possible options to add to your photography equipment collection. 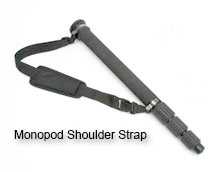 The three most popular accessories for monopods are monopod heads, neck straps, and monopod cases. The one accessory for your monopod that you should consider as a must have an appropriately sized ball head. This is a picture on the right of the RocketFish Ball Head that I use on one of my ball heads. It's small but it functions quite well. When cameras are mounted directly on top of a monopod without a head attached, you limit you ability to shoot upward or downward without significantly leaning your monopod forward or backward. Also without any way to rotate your camera to a vertical orientation you are stuck shooting all your pictures as horizontal. With a tripod I prefer a pistol grip ball head. 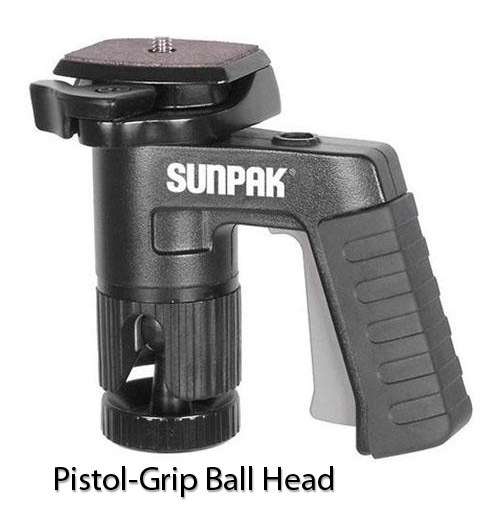 Pistol grip ball head's best feature is the ability to adjust your camera position extremely quickly. This would be a big advantage to have with sports and wildlife photography where the action is fast. There are some camera accessory kits that include a lot in addition to a monopod. Some can include tripods, a monopod, cases and a remote shutter release that are an interesting consideration. This accessory kit on the right is extremely affordable and full of goodies that include a monopod, tripod and cases for both. Although many of the components are made of plastic and are of average quality, accessory kits like this may still be a good value because of what they include. The most obvious accessories for monopods are carrying cases and shoulder straps. Carrying cases can also be used for light stands and other photography lighting equipment like umbrellas. Carrying cases also provide a bit of protection from dirt or damage to your monopod. I just personally find them unnecessary as an additional item to have to worry about. The shoulder straps are very valuable, especially if you have a professional monopod which is substantially heavier than the light-weight models designed for point and shoot cameras. It's a good idea keep your camera attached to your monopod if you are out on a walking photo shoot. Then you are able to get a quick photo if an opportunity arises in an instant. Monopods that come with wrist straps are popular as well with many photographers. Personally I have never used one. I either strap my monopod to my camera bag or use it as a walking stick. I do like to use a shoulder straps with my tripod because my Bogen is fairly heavy and if I am walking for a distance, it take all the weight off my arm. The biggest advantages of using a ball-head are its compact size and weight and its versatility. Monopods are also extremely valuable for shooting videos whether you are using your cell phone camera, a point and shoot, a DSLR or even a dedicated camcorder. Is there anything more annoying than watching a video that bounces around and either causes confusion or gives you a headache or motion sickness. Monopod accessories valuable a nice additional piece of equipment to buy if you have the funds to spend. Another possibility to consider is getting a design that is good for video and digital photography, the video monopod. Shoot more photos! Watch less TV.